It’s so important to block YouTube comments, especially if you’re ranking CPA videos. Some people don’t bother but it can really help your conversionA lead or conversion is when a visitor follows through with the offer they are presented with. For example, when someone finds your content and clicks on an offer and completes it. You get a conversion thus earning you money.... More rates big time! Do you want people losing faith after reading negative comments? Do you want to have other people stealing your trafficTraffic is the visitors that flow through your website or in other words visitors. The more the better!... More by commenting their own links? That wouldn’t be very smart, so let’s figure out a way to block all negative comments. 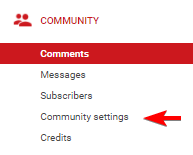 For this little tutorial we’re going to be using Community Settings found in the Creator Studio. As I’ve already mentioned, lots of people dismiss these. I really don’t understand why because surely you want your trafficTraffic is the visitors that flow through your website or in other words visitors. The more the better!... More to be convinced before even clicking on your link right? That would be much better than someone checking it out after seeing multiple comments saying “not working” or worse. This is really bad for your conversionA lead or conversion is when a visitor follows through with the offer they are presented with. For example, when someone finds your content and clicks on an offer and completes it. You get a conversion thus earning you money.... More rates. You’ll get less clicks to your website, and those who do click will be less likely to convert. This one is super simple! In the past you used to have to block terms like “http://” “www.” and “.com” etc to get rid of these. 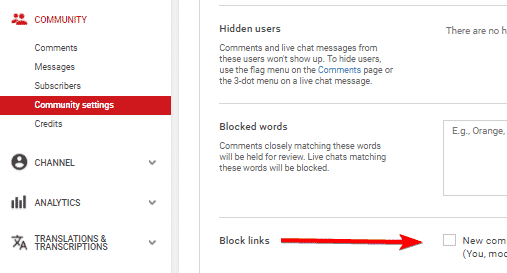 However, since a while ago YouTube added a feature to block all links without having to add these filters yourself. Just check the box and you’ve now blocked all those pesky linkers! This will block all clickable links. This will depend on what you consider bad comments. For my purpose, I want to block all comments that say negative things about my video such as “fake” and “not working”. I actually have a big list I compiled from over the years. It works well for me, if a comment slips by I add the phrase into my blacklist. As you can see I have quite a few blocked words in my filter. This will save me time in the future when moderating comments on my CPACPA stands for Cost Per Acquisition or Cost Per Action. What this means is that you get paid for each time you convince somebody to take action on an offer or acquire a new customer for the advertiser. This is called a conversion.... More videos. I will make this whole list of phrases available to you for free. Enjoying the article? Consider subscribing to be notified when I post! If for whatever reason you want to let a comment show just go to your Comment Manager and you can find them there. 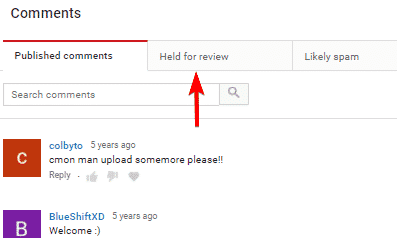 Just hover over the comment and click on the little tick to approve it. Just to let you know, some positive comments can and will be put into your moderation queue and you’ll need to approve them manually. It’s still better to block YouTube comments like this and approve them later because allowing bad comments that often use the same phrase can be detrimental to your overall earnings. Once again, thank you for reading and if you liked this article consider subscribing to my blog in the sidebar(or below the comments if you’re on mobile). Also, all the information you share with us is pure gold bud, thank you for doing that for all of us! another great post. and yes, we can’t check each videos everyday, some guys post a link to steal your money. it’s really important to block these links. Thank you! This is a great way to save time so you can focus on bringing more traffic!